Hello and welcome back to another update of Forgotten Hope 2. This week we are releasing a small server-side hotfix as well as showing off the most numerous Soviet field gun that was produced during World War II. Enjoy! Up first, we have a follow-up server-side hotfix to the 2.4 release. It is is important to note, that if you are not a server administrator and do not run your own server, you do NOT have to download the following patch. You can download the patch and view the short changelog below. Before we get on with the rest of the update however, we would like to make a quick statement regarding development on the upcoming, Russian front. Although we are now showing Soviet guns and vehicles in the news, it will still be some time before we are ready to release our first Eastern Front patch. At the moment, most of our efforts are directed at finishing our remaining Africa, Normandy, and Battle of the Bulge maps, which we hope to release in the next patch. So, to avoid confusion, we would like to stress that our next patch will not contain any Eastern Front content. Our last item for today is a new Soviet gun that should come in handy if you find yourself up against a horde of German armor. Today we are showing off the Soviet, ZiS-3 anti-tank gun! The 76mm Divisional Gun M1942, or ZiS-3 as it was better known, came about during the initial stages of the Soviet campaign to fill the need for a medium caliber gun that could destroy the German armor at the time. The design was relatively simple with a 76.2mm gun mounted on the carriage from the older ZiS-2. Combat experience showed that the ZiS-3 was largely superior to other Soviet AT weapons, and the gun's extreme reliability and accuracy meant that it was well liked by both the enlisted men and the top brass. In all, from 1941 to the end of the war, production of the gun reached well over 103,000. 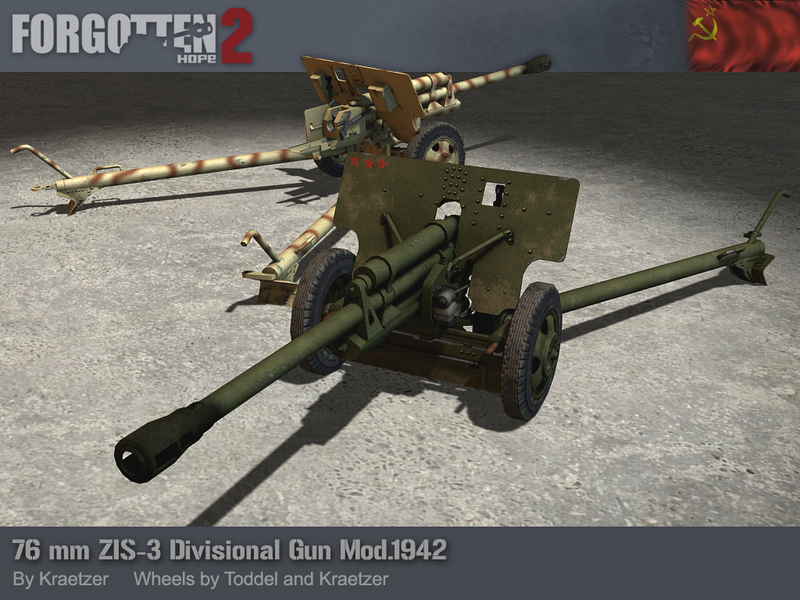 The 76mm Divisional Gun M1942 (ZiS-3) was made by Kraetzer, with help from Toddel on the wheels. Hello and welcome back to another update of Forgotten Hope 2. We are back this week to present a render of another lightly skinned vehicle. This one however, will be better suited to the green hills of Italy rather than frozen tundras of Russia. We are of course talking about the Fiat 508 C.M. light utility vehicle! The Fiat 508 started life a civilian vehicle in the 1930's, with the military version being produced from 1939 all the way to 1945. It was created to fulfill the need for a good, inexpensive cross-country vehicle. Although it was not produced in numbers near that of the American Jeep or German Kubelwagen, the 508 earned a reputation for being both reliable and robust throughout the Italian colonies and North Africa. It featured a 39-horsepower engine with a 'soft-top' roof, and could carry up to four soldiers. Surprisingly however, it did not feature all-wheel drive. The Fiat 508 C.M. was made by Kraetzer. We would also like to let everyone know that this week is the 18th Forgotten Hope Game Night (FHGN). Be sure to join all of your fellow players on Saturday, the 27th of August, for a night full of Forgotten Hope 2! Make sure to check the forums throughout the week for more information. Hello and welcome back to another update of Forgotten Hope. It has been several weeks since our last update, and we hope everyone hasn't gotten frostbite from the new patch. Today we are back, ready to kick things off for the post-release future! Before we continue on with the rest of today's update, we'd first like to thank everyone for downloading and playing FH 2.4. This last patch has been a huge success for us here on the development team and it serves as a huge moral boost to all of us to see everyone enjoying FH2 so much. So to all of our fans, we say thank you! Thanks to the new stats and ranking system introduced in FH2, we can now gather specific information on how popular certain areas of the mod are, and how many times a certain object has been used. For example, the most popular map so far has been Meuse River, while the most popular weapon type has been the standard infantry rifle, with the most successful team being the German military. In terms of awards, the most common one is the Objectives Award - Bronze, with these awards being awarded only once so far: Artillery Spotter, Submachine Gunner - Silver, Anti-Air Gunner - Silver, and the Battle of the Bulge Commemorative Medal. But that's not all! As of August 2nd, Forgotten Hope 2.4 has seen a total of 6,376 players log on, with a total of 1,285 rounds played. That amounts to a staggering 31,187 combined hours played, and a massive 632,822 total kills. 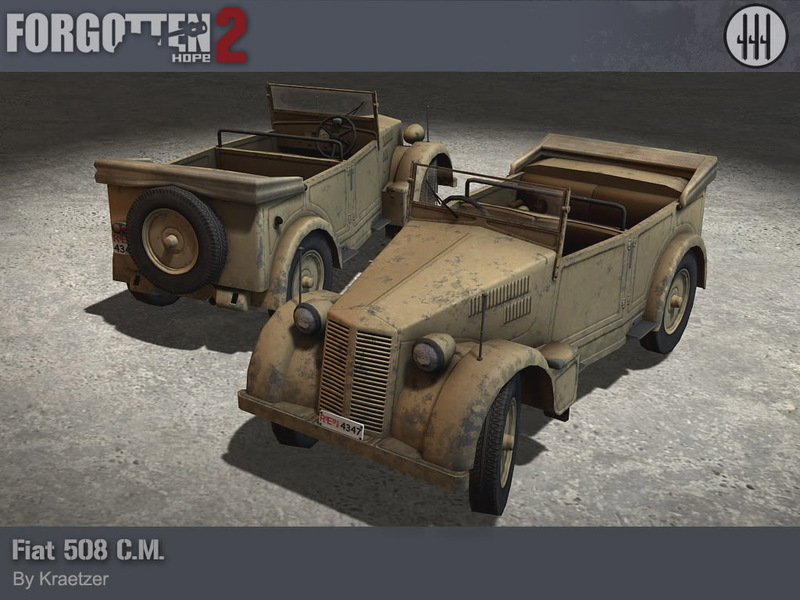 As many of you remember, after FH 2.3 won the 2010 Player's Choice Mod of the Year competition, we revealed that we had begun work on bringing the Eastern Front into the world of Forgotten Hope 2. However, apart from the original announcement, details on the subject were scarce. 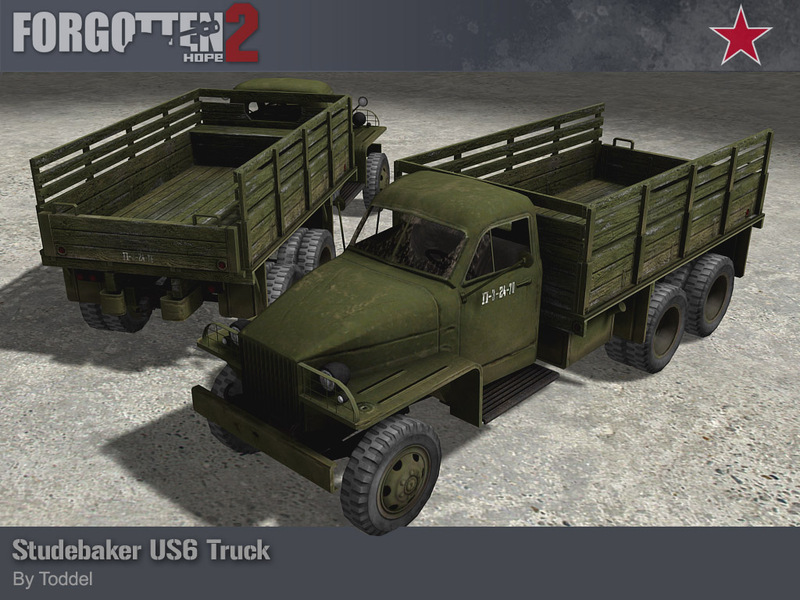 Today, we can begin to show more, and our first render is of the Russian Studebaker US6 general purpose truck! The Studebaker (or Studer to the Soviets) was a 2.5 ton GP truck that was manufactured and used by both the American and Soviet forces. It featured a 94-hp engine and came in 13 different variations. The trucks build for the Lend-Lease program were put together by the Studebaker corporation itself, and then were sent off through the Persian Corridor. Once in Russian hands, the US6 was used in a variety of roles from pulling artillery to transporting infantry. But perhaps its most deadly role was serving as a platform for Stalin's Organs; better known as the Katyusha Rocket Launchers. The Studebaker US6 truck was made by Toddel. On a quick and final note, if you haven't noticed, FH2 has moved to a new and proper Facebook page. You can view the new page here, and don't forget to 'Like' us as well.